There are a lot of direct bus service to/from Kuala Lumpur and Singapore. There are numerous fleets of Luxury Executive Express coaches servicing between Malaysia and Singapore. When you travel by these busses it takes almost five hours to reach your destination. 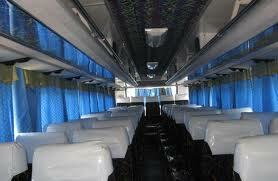 The bus service offer many facilities that will make your travel a pleasurable experience. While waiting for the bus departure, you can keep your luggage at the luggage counter in the waiting lounges. You can help yourself to the flow beverage while waiting. In the future, there are a few lounges that are also providing free WIFI internet access at the lounges. In the bus, the ergonomically designed bus seats are spacious and comfortable with two seats on one side and one seat at the other side of the bus with an aisle in the middle. The seats are recline-able with ample leg room with leg support when reclining. Each seat comes with an individual TV screen with Video On Demand (VOD) services providing on-board entertainment featuring music and movies. The luxury coaches plying between Singapore to Kuala Lumpur emphasize on safety as their coaches are built with speed limit and uses air suspension. It uses environmental friendly Euro 3 compliance engine which causes minimum pollution. The coaches are also designed in compliance with ADR (Australia Design Rules). Moreover, the bus travel charges for one trip are very reasonable and are different only because of the variety of coach and the date you travel. The coach will stop at meals centres and public washrooms during the day travelling according to the traveller’s convenience. A lot of companies have come up offering bus services in this route. Going to the terminal and buying ticket can be a hassle for a person. There are certain people who may not have time to go and buy bus ticket. In such case there is also the option of online booking of tickets. It is very convenient to book ticket this way as you can get the option of buying the ticket for the seat of your choice. The trend of buying ticket online has gained popularity. If you are going by bus to Kuala Lumpur you can check all the websites and you will know exactly what time the bus will depart, then you can choose the seat where you would like to sit. It makes for very convenient method of travelling. You only have to reach your preferred bus terminal on time. There is also the choice of booking in a bus of your choice. If you prefer to travel by bus of a particular company and would like to book ticket on that only, you have that option as well. Buying bus ticket online for your travel from bus Singapore to KL will give you many advantages like the saving of time that you waste while going to the counter. You also save on transportation; you are free from the hassle of standing in a queue, buying with credit card and other advantages. Now you can have a hassle free journey in this part of the world.